We have seen some strange social experiments and pranks in our time, but not too many as elaborate as this gag. 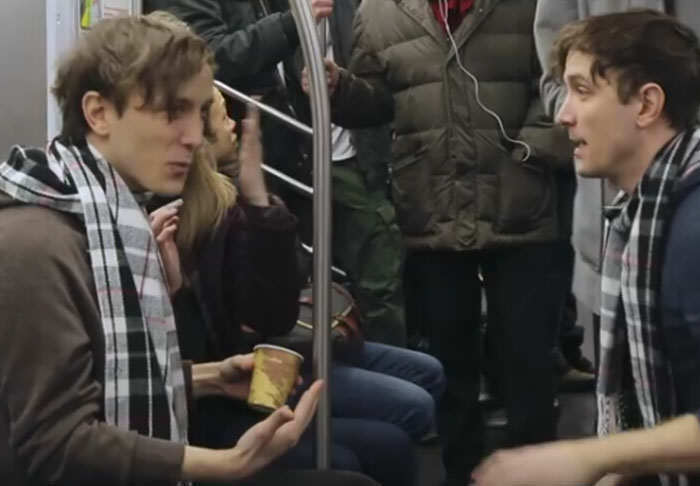 Comedy group ‘Improv Everything’ invaded a New York City subway car recently and set about confusing passengers over the potential for time travel. A man appears before passengers appealing for donations so that he can produce a machine to make the sci-fi theory a reality, but before he finishes an identical man sporting a beard and long hair appears imploring passengers not to donate. Before the scene is done three more sets of twins appear to their ‘present selves’ to warn them against the supposed dangers. Okay, maybe there is a reason these guys are acting on the subway and not in Hollywood, but it is a damn good effort and other passengers definitely had to look twice. But fair play to them for finding so many sets of twins who were game for the prank.